Having struggled with back pain for years after pregnancy, I finally discovered Dorn and was amazed and delighted by the way my back was transformed! I trained as a Dorn practitioner so that I could share the benefits with my clients – in particular with my Mummy clients, who often battle on through back pain, accepting it (as I did) as an unfortunate side effect of pregnancy and parenthood. You are experiencing pain/discomfort in your back, hips, or neck. You want to find a way to care for your back in the long term and learn self-help tricks to use at home. 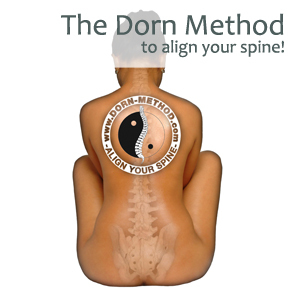 Because the Dorn Method does not use manipulation, there is no clunking and no painful adjustments to worry about. Instead, the treatment is led by you, the client, who is guided to gently move your legs and arms to aid the realignment of each joint. Each appointment combines a treatment to realign the hips and spine, a relaxing Breuss massage to deeply nourish the spine, and advice about simple exercises to use at home (2 minutes a day) which will extend the benefits of your treatment and help you to avoid future problems. The idea is that you don’t have to have to come back and see us too often – though of course, you may send your friends! Home Visits Unfortunately, I am unable to offer home visits for this treatment. Appointments are available on Wednesdays and Thursdays at The Practice Rooms in central Exeter (15-16 Castle Street, EX4 3PT). These are lovely rooms where you can relax and rebalance in professional, yet cosy and friendly surroundings. 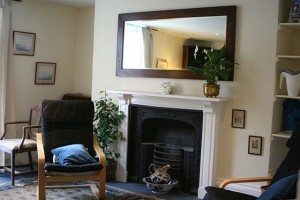 We are within a few minutes walk of all central Exeter car parks and just a 5 minute walk from Exeter Central Station. Dorn Method treatments now available in Exeter, Devon.